Looking for a viable alternative to excessive real estate fees? With our professional and competitive natures, you can be confident we will work hard to sell your home for the most amount of money in the shortest amount of time. Our guarantee to you: If you are not satisfied with our service and the current market activity generated, let us know, we will work to correct and change the situation. If we are unable to rectify and generate results, we will offer you the opportunity to “cancel” the listing at “no cost” to you. Real Estate fees have finally evolved! That’s something to get excited about. 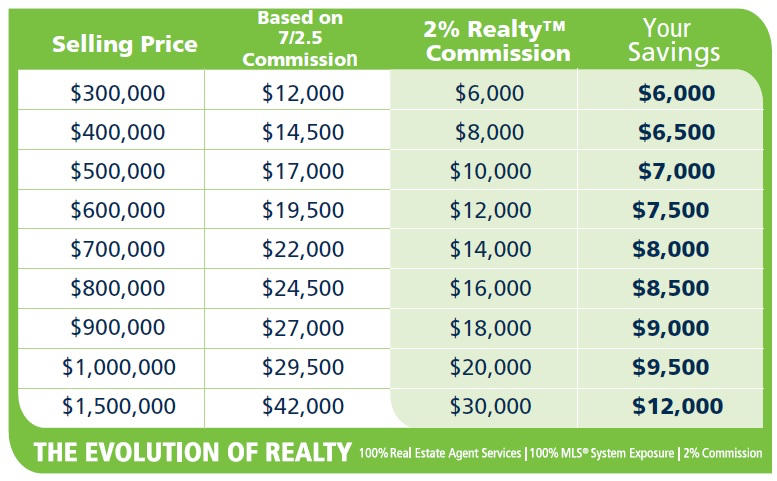 Check out the 2% commission comparison chart below and see how much you could save. We also have FULL buyer’s Realtor commission split options available, both will save you thousands. Call/Text 604.722.7196 or click "Free Evaluation" on top menu bar TODAY for your no-obligation consultation and get ALL the facts before you list your home and pay too much. Let us show you the best properties on the market. We have the Real Estate expertise to sell your home quickly and seamlessly. Contact us today to discuss how our team can help you with your Real Estate needs.